So write Sens. Joni Ernst (R-Iowa) and Mike Lee (R-Utah) in The Washington Post. Over a long career, Beau has helped thousands of everyday Americans plan for retirement — as a financial adviser, syndicated radio host and best-selling author. Given Washington’s penchant for acronyms, Ernst and Lee have dubbed their bill the Child Rearing and Development Leave Empowerment Act — or CRADLE Act. Aren’t you feeling the warm fuzzies already? 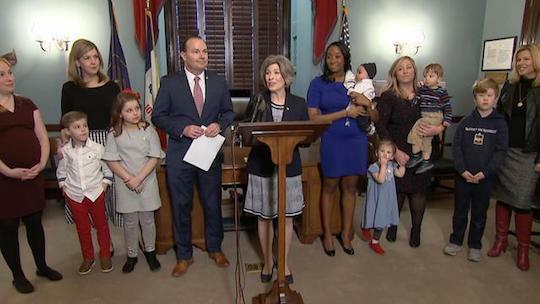 Lee and Ernst introducing the bill at a photo op, surrounded by frazzled congressional aides who had to drag their kids to work for a day smiling moms and kids. Per the senators’ article, the bill “would allow new parents to receive one, two or three months of paid leave… after the birth or adoption” of a child. But unlike many “paid family leave” proposals, the senators promise their bill won’t add a penny to the national debt. So what’s the catch, you wonder? “The bill gives parents the option of receiving some of their Social Security benefits early to cover the costs of leaving work to care for a new child,” says Beau. “For every month parents receive this early benefit, they need to delay their retirement by two months,” Beau explains. “In other words, if you elect to receive three months of this maternity/paternity benefit, you won’t be eligible for retirement benefits until six months past when you’d ordinarily be able to get them. “If you have three kids and accept three months of early payments for each, you’ll have to wait an extra 18 months to retire. “In my professional opinion, that is a very bad deal,” says Beau. We can see how it would be tempting for a young or middle-age couple with a newborn to “take the money and run” — especially if your assumption is that Social Security won’t be there once you reach retirement age. There are millions of older Gen Xers who figured when they were in their 20s and 30s that they’d never collect a dime of Social Security and their FICA taxes were just money poured down the rathole. Now they’re only 15 or 20 years away from retirement and realizing they probably will collect benefits, even if they’re not as lavish as once advertised. In other words, the continued existence of Social Security is predictable — more predictable, frankly, than your own life circumstances. Says Beau, “All it takes is one unexpected event, like a forced early retirement, to throw your plans into a tailspin. “Right now you may be planning to work right up until your full retirement age. But your work life could still end prematurely — due to poor health, disability or job loss or even to care for a spouse or other family member. Chew on the following numbers, courtesy of the Employee Benefit Research Institute. 9% of those surveyed expect to retire before 60. 39% left the workforce before 60. One more stat Beau wants you to consider: “According to the Federal Reserve’s most recent Survey of Household Economics and Decisionmaking, the average retirement age in the United States among living retirees is 59.88. [Ed. note: Did you know Americans have left billions of dollars in unclaimed Social Security benefits on the table? Don’t be one of them. Follow Beau’s strategies and you could add tens or even hundreds of thousands of dollars to your lifetime Social Security benefits. He tells us about a couple from Nebraska who acted in the nick of time — and wound up with the potential for an extra $231,629. Manufacturing data from Europe came in way weaker than expected today… and a reading on U.S. manufacturing registered a 21-month low. At last check, the Dow and the S&P 500 are both down about 1.25%, while the Nasdaq is down more than 1.5%. All of the week’s gains, wiped out in two hours of trading. But the real action is in the bond market, where something just happened for the first time since [cue scary music] 2007. 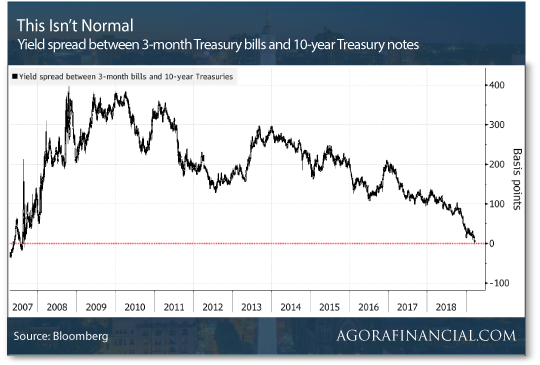 Treasury rates are now exhibiting an “inverted yield curve” — in which a shorter-dated maturity has a higher interest rate than a longer-dated maturity. This morning, you can lend your money to Uncle Sam for three months… and you’ll collect a slightly higher interest rate than you would if you lent for 10 years. Thus the line on this chart dipping slightly below zero. That’s not normal. The way the bond market usually works is you collect a higher interest rate by lending over a longer stretch of time. In theory the risk of default is higher the longer the borrower has your money. Don’t get the wrong idea. The federal government is not in danger of defaulting. But an inverted yield curve is a fairly reliable indicator of an approaching recession. And it lines up nicely this morning with the aforementioned poor manufacturing numbers. A couple of caveats about this inverted yield curve: The spread between the 3-month Treasury yield and the 10-year is not the most closely watched INCOMING RECESSION! metric. Rather, it’s the 2-year and 10-year, and that number remains a bit above the zero line this morning. Even if the “2-10 spread” goes below zero, history shows the recession doesn’t set in for another 18 months or thereabouts. Gold can scarcely be bothered with these new developments: The bid is steady-Eddie this morning at $1,312. Took long enough, but the president finally threw a cat among the pigeons at the Federal Reserve. Too bad it’s a fat and happy house cat that won’t intimidate the pigeons for a minute. As we’ve carped from time to time, Donald Trump had the rare opportunity to fill five of the seven positions on the Fed’s board of governors. We weren’t expecting him to appoint a perceptive Fed critic like Jim Grant of Grant’s Interest Rate Observer (even if hope sprang eternal). But neither were we expecting him to fill most of the slots with egghead academics and career Fed apparatchiks — which is exactly what he’s done. This morning brings word the one remaining slot will be filled by Stephen Moore of the Heritage Foundation. Moore is in line with Trump’s thinking. In a radio interview three months ago, he said the Fed was “wrecking our economy” with its interest rate increases and debt sales. Nor is Moore worried about inflation because “there’s such a demand” for the U.S. dollar. From Washington, word of what could be a huge new catalyst for legal cannabis. By and large, pot remains an all-cash business because federally regulated banks want nothing to do with the plant. The bill would give banks the all-clear. Of course, opportunity abounds already: Only yesterday, Ray urged his premium subscribers to sell half their position in one of his picks — good for 140% gains in less than six weeks. Want more where that came from? Look here. If America is a nation of consumers, it is also increasingly a nation of crocked consumers. Or so we’d glean from a new survey by the personal-finance website Finder. It concludes Americans spent $39.4 billion in the last 12 months on spontaneous drunken purchases — up 29.6% from the previous year. The good news is that the number of people who fessed up to a purchase while plotzed is declining — from 46% last year to 26% this year. Hmmm… That sort of variance makes us wonder if we’re looking at a mighty limited data set here. In any event, the average annual spend among people who acknowledged besotted buying was $736. In any event, food is the most common drunk purchase — cited by 52% of drunk shoppers. That’s followed by clothing and shoes at 43% and cigarettes at 30%. Draw your own conclusions. “Dave, you are absolutely correct,” writes one of our regulars: “Gold is not the only rigged market, and manipulation does not invalidate trend following or other forms of technical analysis. “Stock markets are rigged too. So are bond markets, commodity markets, currency markets and interest rates — as well as fiscal/monetary policies. Nothing in finance is pristine. Chart watchers simply propose that useful information is conveyed in price action and other ‘technical’ indicators. These don’t substitute for ‘fundamental’ data, but instead complement them. “Precious metals markets are relatively small compared with other assets. So a modest influx of money can move the needle significantly, especially when gaming them via futures/paper trades. The 5: Keep stacking, brother! P.S. Did you know you can add only “five words” to your Social Security application form and collect up to an additional $1,000 every month? That’s just one of the secrets you’ll learn when you open up the “Retirement Box” we’re ready to ship to your door, FREE. You can also learn about a little-known “loophole” with which to legally collect a portion of your benefits before you retire.